Spain is located in southwestern Europe on the Iberian Peninsula. It has an area of 195,364 sq. mi. (504,030 km2) and in 2008 had an estimated population of 46,157,822. Before 1976 the sporadic presence of Spanish Mennonite Christians was due to contacts by emigrated Spaniards with Mennonite congregations in Switzerland, France, Belgium, and Germany. Once these few Christians returned to Spain, they either associated with the existing Protestant congregations, especially Baptists and Plymouth Brethren, or they remained anonymous. After the death of the dictator Francisco Franco in 1975, many mission boards began to see that Spain had open doors for them. In 1976 the Mennonite Brethren Board of Missions and Services and the Mennonite Board of Missions (Mennonite Church) sent missionaries to Spain. The Mennonite Board of Missions (MBM) initiated work in Barcelona as an intentional community while the Mennonite Brethren began forming a church in Madrid. Ten years later, the Mennonite presence in Barcelona had developed a congregation and a senior citizens' home. In Madrid the Mennonite Brethren had one congregation with three meeting places. After 1981 the work of the Christian Community in Quintaladueña, Burgos, helped by MBM, was consolidated with a congregation and a ministry working with prisoners and drug addicts. There also were some groups who identified in a general way with the Anabaptist testimony. This was the case of the congregations in Fuenlabrada and in Vallecas, Madrid. In general terms, after ten years of Mennonite testimony in Spain a combined membership of 120 persons could be estimated. Gallardo, Jose. Freedom for the Captives: How Love is Rebuilding Lives in Spain. Scottdale, 1988. Garcia-Villoslada, Ricardo. Director. Historia de la Iglesia en Espana, vol. 3. Madrid: Biblioteca de autores cristianos, 1975. Menendez-Pelayo, Marcelino. Historia de los Heterodoxos Españoles, 2 vols. Madrid: Biblioteca de autores cristianos, 1978. Mennonite World Conference. "2000 Europe Mennonite & Brethren in Christ Churches." Web. 27 February 2011. http://www.mwc-cmm.org/Directory/2000europe.html. Mennonite World Conference. "2003 Europe Mennonite & Brethren in Christ Churches." Web. 27 February 2011. http://www.mwc-cmm.org/Directory/2003europe.html. Mennonite World Conference. "Europe." Web. 27 February 2011. http://www.mwc-cmm.org/Directory/2006europe.pdf. Mennonite World Conference. "World Directory: Europe." Web. 13 June 2010. http://www.mwc-cmm.org/en15/files/Members2009/EuropeSummary.doc http://www.mwc-cmm.org/en15/files/Members2009/EuropeSummary.doc. Mennonite World Conference. World Directory = Directorio mundial = Répertoire mondial 2012: Mennonite, Brethren in Christ and Related Churches = Iglesias Menonitas, de los Hermanos en Cristo y afines = Églises Mennonites, Frères en Christ et Apparentées. Kitchener, ON: Mennonite World Conference, 2012: 16. Mennonite World Handbook Supplement. Strasbourg, France, and Lombard, IL: Mennonite World Conference, 1984: 124. Zorilla, Hugo. "Spain." Global Anabaptist Mennonite Encyclopedia Online. May 2014. Web. 19 Apr 2019. http://gameo.org/index.php?title=Spain&oldid=122596. Zorilla, Hugo. (May 2014). Spain. Global Anabaptist Mennonite Encyclopedia Online. 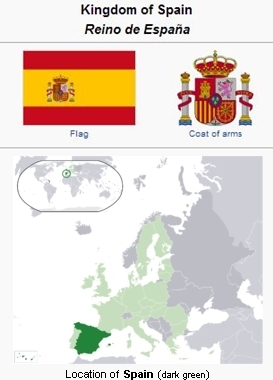 Retrieved 19 April 2019, from http://gameo.org/index.php?title=Spain&oldid=122596. Adapted by permission of Herald Press, Harrisonburg, Virginia, from Mennonite Encyclopedia, Vol. 5, pp. 848-849. All rights reserved.